Apple sauce is great just to eat alone, or to put on oatmeal, eat with pork chops, make muffins, and there are so many other great recipes to use it in!! Depending on the type of apples you use, you'll find that you may need to adjust the below amounts of sugar, water, and lemon juice. As well, you'll definitely want to use a good quality vanilla. Lastly, you can either leave the peel on the apples or remove prior to cooking. I personally prefer to leave the peel on because I'm lazy and don't want to peel so many apples, but I also like the added flavor and texture. Again, depending on your apples the skin may break down more than others. - Combine and place all ingredients slow cooker. - Cook on high for 4-5 hours, stirring occasionally. - Once apples are soft, and if you've left the skin on, use a hand blender to mush all up. I usually double this recipe and use my 5 quart Crock Pot. AND it makes my kitchen smell delicious!! oooooo, how delicious! I was sitting at my desk and saw this title and my stomach started to rumble...just sounds yummy! I love apples, especially in combination with cinnamon or toffee cream. I love the idea of homemade apple sauce! I eat it all the time with pork chops, so this makes a lot of sense. Your apple sauce sounds yummy. I love making it every fall too. I wanted to make some this weekend but I was busy canning tomatoe sauce and peaches. Sounds like a great recipe. Homemade apple sauce tastes so homey. I love the addition of vanilla in yours. Perfect for the upcoming fall months--I can't believe it's starting to feel like them already! Oh, yum! How long does it keep? @Mary: It will keep for a couple weeks in the refridgerator. Of course, longer is you can it. Where were you when I was finishing up my batch? :) I used my crock pot for apple butter but didn't even think about doing it for applesauce! Of course, I made enough for canning so it might not have worked so well. Your recipe looks VERY yummy. This looks really great. I just wanted to invite you to come check out my "Canning Week Blog Party" on my blog this week. We are daily posting tips and recipes about canning as well as a linky party and give-a-ways. Hope you can stop by and link up!!! do you have a preferred apple? OH this sound wonderful and so EASY!! I am so gonna try this one out- Thanks! I have an apple tree, always looking for ways to make use of my apples. The boys would love this. Stop by and see if my desert can temp you. 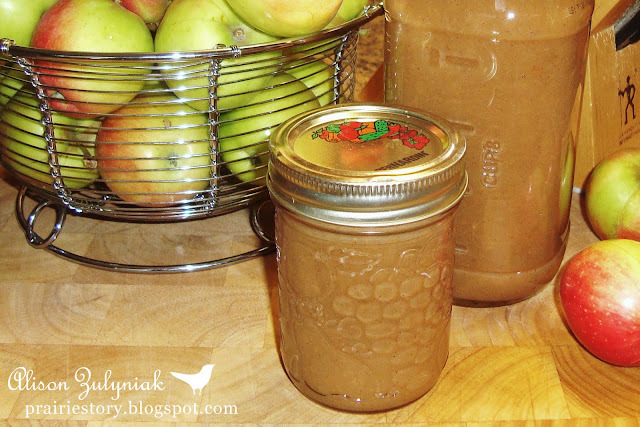 I love homemade apple sauce and what a wonderful, easy way to make it. Thank you so much for contributing this recipe to my Cookbook Sundays. I'll definitely be back Thursday for your recipe swap. Have a great day! I do this when I get apples cheap, it really is delicious! We love applesauce in our house..... Thanks for linking up to Slow Cooking Saturdays Recipe Swap. i followed this recipie exactly and of course the sause came out dark and too sweet. So I fix this just by adding more apples?? It says adjust brown sugar to taste. So you decrease the brown sugar... if you mean how do you fix the current batch, I suppose you could try adding more apples? Wow, this was amazing! I think I can eat all of it myself.